I'm very glad to announce that I've finished my first two pieces. 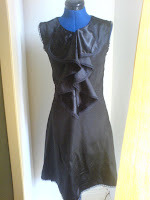 One of them is a black satin sleeveless dress with ruffles on the neck. It's very feminine and ultra fitted! 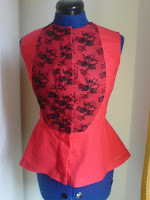 My other item is a 1940's style sleeveless shirt in red cotton. It has a frontal black lace piece on the chest. It's very fitted on the waist and has a very wide skirt. Both of them are for sale on the Velvet Garden auction website!!! My MAIN aim is offer clothes at all Gothic enthusiasts who wish to dress as goths everyday as well as everynight. I have always thought of starting my own private range of gothic pieces as I was tired of seeing the same unpractical and xtra-long dresses which are beautiful for a night out but not for running after the bus. So, this lead me to the main question, where to find gothic clothes that I can wear everyday BUT at an affordable prices? Not everyone feels comfortable going to Zara or Gap looking for "unique black pieces". Some High fashion houses have flirted and still are with Goth, but not everyone can afford their clothes. Think of Gucci (when Tom Ford was in charge), Alexander Mcqueen, John Galliano, John Richmond!, Anne Demeleumeester, Ricardo Tischi, Gareth Pugh or the queen of all: Vivienne Westwood. Welcome to my little Black Wardrobe!!! If you are looking for darkly romantic and victorianesque pieces for everyday as well as for everynight, then this is your place. If you have anything to ask or comment, please feel free to post it.